The first update is that all fan-gates / like-gates will be removed from our Facebook app. 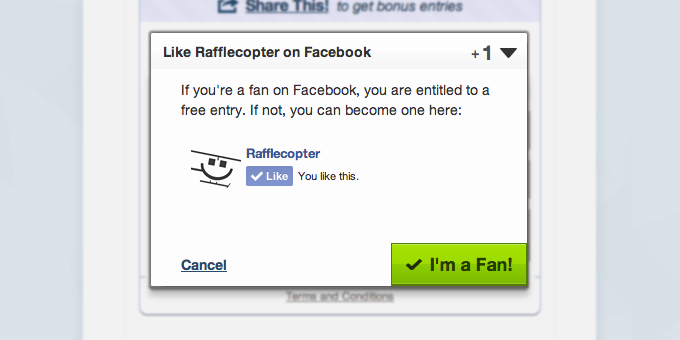 If you’re running a giveaway on Facebook using the Rafflecopter Facebook app, the fan-gating functionality of the app will disappear. When you enter a giveaway with this entry option, you’ll only be able to complete the entry only once the specified Facebook page is visited. Once the ‘visit us’ button is clicked, you’re able to complete the entry. To stay within all Facebook guidelines, entrants aren’t incentivized to like your page (though they are encouraged to like and comment!). 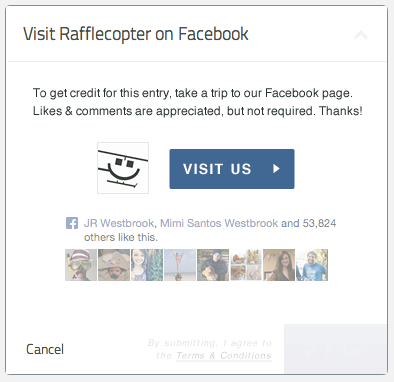 This entry option is set up to help bring more attention to your Facebook page. It’s an exciting update that we think will help boost authentic interaction with your page. These three updates listed above will be put into place in the evening of Wednesday, November 5th between 9pm and midnight EST. Once they’re updated, the fan-gate from our Facebook app will be removed for all giveaways despite when the promotion started or how far along it is. This is something set in place by Facebook that’s out of our control. The ‘Like a Fan Page’ will be turned off at the same moment the ‘Visit a Facebook Fan Page’ will be activated. One entry option will be swapped with the other. Again, you can expect this to happen in the evening of 11/5. All giveaways that started before 11/5 that used the ‘Like a Fan Page’ entry option will be allowed to have that entry option until the giveaway is over. Starting 11/5, no giveaways will be able to be created with the ‘Like a Fan Page’ entry option. We’ve received several questions over the past two to three weeks that we thought it would be a good idea to share with you. Of course if you have additional questions, feel free to comment below! Q: Has Rafflecopter been in direct contact with Facebook over these updates? We haven’t been in touch with Facebook. There are plenty of apps built on the Facebook platform that these updates affect, and we’re just one of many. We’ve been in touch with Facebook’s team in the past concerning promotion guidelines in 2012 and again in 2013, but this update to their platform has been fairly straightforward. Q: If I have a giveaway running w/ the ‘Like a Fan Page’ entry option past 11/5, will Facebook shut down my page? No. It’s not in Facebook’s best interests to just start shutting down pages, especially because of a promotion guideline infraction. It’s been rarely documented that Facebook shuts down pages for breaking their promotion guidelines (hence why you still might see a lot of giveaways that still incentivize entrants to share a post, even though that hasn’t been allowed for years). It’s a touchy subject — you wouldn’t expect Facebook to aggressively go after page owners. Q: So Facebook won’t come after me? If Facebook were to have a problem with the way the platform policy updates were interpreted and implemented by us in the Rafflecopter app, they’d email us first before emailing the folks using the app for their page. If they were to email us, we’d work with them to see that our giveaway widget is brought within their guidelines as they have done in previous years. Any other questions or concerns you have for us that might have been left out? Feel free to leave a comment below! I love the new feature you’ve added to replace the “like” entry. Hope it increases engagement — that’s a lot more valuable on Facebook these days anyway! My understanding is that we can ask for likes and comments of individual fb posts, just not shares or likes to the page. So I’ve been adding in my own option that requires a comment on my fb post. So I won’t be using the new one that just has them visit my page. Hey Kathleen! It’s within Facebook guidelines to ask entrants to like and comment on an individual post, it’s just really difficult to track who has liked and commented. I think that’s the biggest roadblock to making those kinds of custom entry options. Well what I do is ask them to provide their Facebook name and I can just check if their name is on the like or comment (I usually ask for a comment) You could also ask them to provide a link to their comment but I figure that’s more work for them and they won’t bother. Articles and features like this are why I am a loyal Rafflecopter user. Thank you! In your opinion, Can I create an entry that says “Like this facebook page” ? In your opinion, Can I create an etnry off the RC that says LIKE THIS PAGE (as it’s not part of an app)? You use “Promotion guidelines” in your referenence above, but in fact the promotion guidelines were not changed recently right? Only the direction to API Web masters…Right? You have two statements above that seem in conflict. You say that the entry will be replaced and than further down you say this: “All giveaways that started before 11/5 that used the ‘Like a Fan Page’ entry option will be allowed to have that entry option until the giveaway is over. Starting 11/5, no giveaways will be able to be created with the ‘Like a Fan Page’ entry option.” Please advise. Using the ‘invent your own’ entry option, you could make an entry option that was very similar to our ‘Like a Facebook page’ option that was removed, but we don’t want to encourage that since it’s still something Facebook isn’t ok with. One of the reasons we implemented the ‘visit a fan page’ entry option was to hopefully discourage folks from creating custom options asking for Facebook likes by giving an alternative to the entry option that was removed. I can tell you right now, this is the most ridiculous thing I have ever heard of. I “dislike” this Facebook. How can I add the app directly into a post? I’ve seen it done with other competition apps and it looks great. Hey Ben – shoot us an email at support@rafflecopter.com if we can help! Love that you’ve included a way to still get people to our page, but hate the new rules put out by Facebook! I’m having trouble finding info on if these same rules apply for Rafflecopter giveaways I host on my blog. Am I still not allowed to ask entrants to like my or the sponsor’s Facebook page as an entry or to share the giveaway (my blog post) on their timeline? Thank you. Hey Francesca – that’s correct. You’re not allowed to ask entrants to like a Facebook page as part of an entry or share an article / blog post on a timeline. Hope that helps! Because of that, I’m closing the comments section here, but we added a comments section to that URL so feel free to add to the conversation there. Because of that, I’m closing the comments section here, but we added a comments section to that URL so feel free to add to the conversation there. Just didn’t want people to come to this page and read comments that were outdated. Cheers!